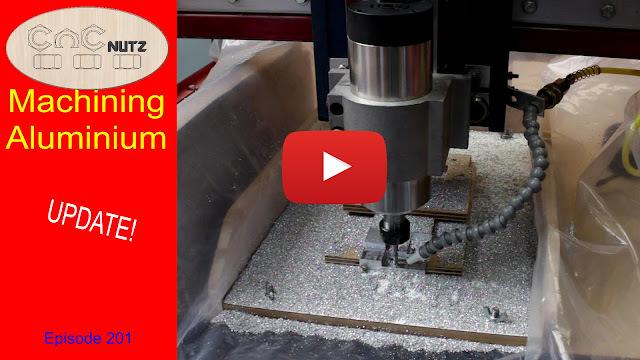 This is an update to the last video Machining Aluminium. Acting on suggestions from comments made by various viewers I gave air assisted cutting a try and having found a suitable cutter for the job set about making another stepped block. The results speak for themselves. Suggestions ranged from what cutter to use to feeds and speeds, cutting fluids and air assiatance to keep the cutter cool. I found a suitable cutter to use and then set up air assistance on my machine. I decided to avoid liquid coolants and misting of coolant as I wanted to avoid liquids if possible this time. All I can say is the difference in the cutting experience was immense with this being an enjoyable experience while the previous effort was little short of a chore. The cut quality was much better and the machine sounded happier. If I cut more in the future this is the method I will use. Coolant or a mister may help but if I don't need it I would prefer to avoid them. Link to Flexible coolant nozzle similar to the one I used on my setup. You need to sellect the size that suits the thread on your compressor hose. In my case it was 1/2" BSP. In the next episode I will be covering the Tool setting block I made and how it differs from other versions I have seen and improves machining.